When you live in a small space, you face unique design challenges. Sure, that sprawling sectional is gorgeous, but it’s not going to fit in a space that does triple duty as a living room, bedroom, and office. Small kitchens present even more hurdles, as you struggle to create a functional, uncluttered space that can fit all the tools you need to whip up delicious meals and entertain guests. Here are five ways to pack a ton of function into your compact kitchen. The first step in maximizing a small space is making sure you’re not holding on to more than you need. This is especially true in the kitchen, where single-function tools can easily overwhelm available storage. A single measuring cup can replace a full set and hold smaller items. That garlic press, egg slicer, and apple corer can all be replaced by one high-quality paring knife. 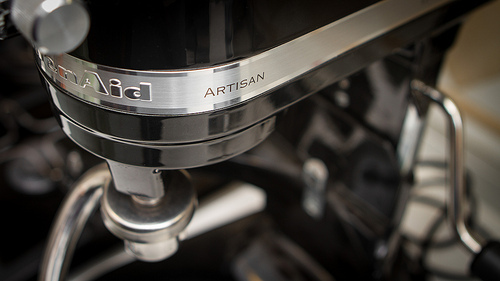 An immersion blender can take the place of two bulky appliances — a standing blender and a stand or hand-held mixer. If letting go of your beloved stand mixer is too much to bear, there is another option: show it off. There’s no rule that says all kitchen tools must live in the kitchen. Turn your culinary possessions into conversation pieces by proudly displaying them in your living space. You can even jazz them up with touches like removable vinyl decals. As a side benefit, when you display your equipment rather than hiding it in a cabinet, you’ll be more likely to use it. A small square of counter space might be enough to prepare breakfast for one, but when guests come over, you’d kill for an island. Here’s the fix — a rolling bar cart can serve as a TV stand or vanity until you need it for kitchen prep. A DIY fold-down desk is an easy way to create a prep surface that disappears when it’s not needed. Mount a peg board or towel bar to the wall and hang pots, pans, and utensils from s-hooks. One often overlooked option is vertical space. If your cabinets don’t go all the way to the ceiling, a custom cabinet solution can give you several square feet of additional space. If remodeling isn’t an option, place items you use less often, such as serving platters and special china, on top of your cabinets. 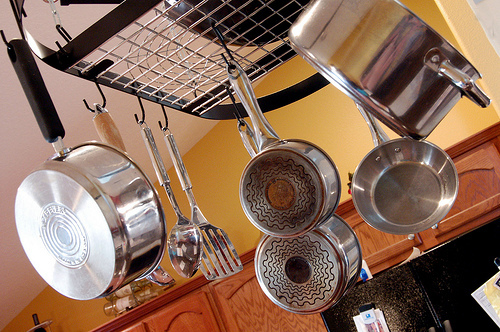 A three-tiered wire basket or pot rack hung from the ceiling can help you take advantage of otherwise wasted space. Cabinets are sometimes quick to fill up with pantry items, while space goes unused in the refrigerator. There’s nothing wrong with storing canned and dry goods in the fridge. Just because you don’t have to refrigerate it doesn’t mean you can’t. Making the most of a small space takes creativity. The good news is there are many ways to create space where you didn’t have it before, and you don’t have to break the bank or bust out the power tools to do it.